Though the CTBT has yet to enter into force, it has been ratified by 153 countries and enjoys almost universal membership of 182 signatory states. 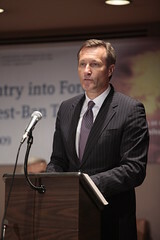 "Bringing the Treaty into force is the obvious and logical next step to take and with adequate political leadership such a step is virtually around the corner," says Ambassador Tibor Tóth of Hungary, who is Executive Secretary of the Preparatory Commission for the Comprehensive Nuclear-Test-Ban Treaty Organization (CTBTO). Among the countries which have yet to ratify is the United States. But Tóth considers it "of utmost importance that all of the 44 countries whose ratification is required for the entry into force provide leadership and not use as an excuse that they are waiting for the United States to ratify." Tóth and his highly committed international staff have been working hard almost unnoticed by the public eye to mobilize universal support and build a reliable verification system since the CTBTO was established in 1997 with headquarters in Vienna, Austria. "The verification system has already proven its worth," Tóth tells IDN global editor Ramesh Jaura in an exclusive interview. When North Korea tested a nuclear device in October 2006, the CTBT member states received exact information about the magnitude, location, depth and time of the test only two hours after it occurred. This was repeated in May 2009, he adds. Question: What would you describe as the highlights of CTBTO Preparatory Commission's work since its inception in 1996? More successes rather than failures? Or the other way round? Tibor Tóth: Today, the Comprehensive Nuclear-Test-Ban Treaty (CTBT) boasts 153 ratifications and almost universal membership of 182 signatory states. Ten years ago 51 of the 155 states that had signed the CTBT had ratified it and not one monitoring system stations had been certified. Today a global network of nearly 250 stations is in place to detect any sign of a nuclear explosion anywhere in the world. It is remarkable to note that all this happened during a time when the Treaty faced an adverse political climate. Countries voted with their feet in support of this Treaty, and in actual fact have established the Treaty as a universal norm. The political landscape today looks vastly different as well. A number of key high level events in recent years have demonstrated that multilateralism is not a relic of the past and furthermore that support for the CTBT is widespread and growing. Last year's Conference on Facilitating the Entry into Force of the CTBT enjoyed unprecedented high level attendance with representatives from 103 countries taking part. The Conference adopted, by consensus, a strongly worded Final Declaration calling on the hold-out States to sign and ratify the CTBT for it to enter into force. Signatory states such as the United States, China, Egypt, Indonesia, Iran and Israel joined ratifying States in this call. Also at last year's United Nations General Assembly First Committee, an overwhelming number of countries expressed support for the Treaty by voting in favour of the CTBT resolution. More recently the statement launched at the fifth Ministerial Meeting to promote the entry into force of the CTBT has so far been endorsed by Ministers from over 70 countries. The Preparatory Commission for the Comprehensive Nuclear-Test-Ban Treaty Organization (CTBTO) has built a verification system that is 80% complete -- a system that has already proven its worth. Although a deplorable event, when North Korea tested a nuclear device in October 2006, the CTBT Member States received exact information about the magnitude, location, depth and time of the test only two hours after it occurred. 24 stations detected the test. This was repeated in May 2009 with the difference that as many as 61 stations detected the test that was slightly larger. CTBTO data can also help mitigate disasters and provide civil and scientific benefits. For example, since 2005, the CTBTO has contributed data directly to regional and national tsunami warning alert centres in the Pacific and Indian oceans. The data can enhance the ability of the centres to identify potential tsunami-generating earthquakes and provide vulnerable communities with faster warning so that they can move out of affected areas. This is just one example of the many potential opportunities for applications of scientific research to everyday life. Q: Has your task become easier since President Obama's famous Prague speech in April 2009? Or was that speech just a drop in the ocean with detractors of nuclear disarmament or abolition all around? TT: The Obama administration's support for the CTBT, articulated not only in his Prague speech but in various other forums has certainly created positive impetus for realizing the Treaty's entry into force. As one of the remaining nine among the 44 nuclear technology-capable states (so-called Annex 2 States) whose ratification is needed for the Treaty's entry into force, the significance of U.S. ratification cannot be overstated. Having said this, I cannot stress enough that it is of utmost importance that all of the 44 countries whose ratification is required for the entry into force provide leadership and not use as an excuse that they are waiting for the United States to ratify. The announcement by Indonesia in May that it had initiated the ratification process of the Treaty is another positive step in the right direction. While the remaining Annex 2 States bear special responsibility to fully commit themselves to the CTBT, the signature and ratification of all States that have not yet done so will provide important momentum towards bringing the Treaty into force. Q:. How would you describe the present situation in terms of ushering in a world free of nuclear weapons being achieved in the foreseeable future? TT: Renewed optimism exists today for nuclear disarmament and the total elimination of nuclear weapons. In May, the 2010 NPT Review Conference overcame the failure of 2005 breathing new life into the multilateral disarmament process. Its nearly 190 Member States reaffirmed the vital importance of the CTBT's entry into force as a core element of the nuclear disarmament and non-proliferation regime in its final document. By providing a firm legal barrier against nuclear testing, thereby curbing the qualitative improvement and development of new types and new designs of nuclear weapons by possessor states, the Treaty's entry into force would be a milestone in the global endeavor to rid the world of nuclear weapons. In addition, the CTBT is a valuable instrument for nuclear non-proliferation in that testing is necessary for establishing technical and scientific confidence in any developing programme on the part of would-be nuclear possessors. Bringing the Treaty into force is the obvious and logical next step to take and with adequate political leadership such a step is virtually around the corner..
Q: How do you see your relationship with NGOs and civil society organisations? TT: The role that citizens and civil society worldwide play in ensuring and putting pressure on their governments -- and their parliaments -- to act on commitments made is indispensable to promoting the entry into force of the CTBT. The International Test Ban Campaign, the Nevada-Semipalatinsk movement, and Greenpeace action in the Pacific to mention but a few examples, were all instrumental in achieving the CTBT in the mid-1990s. Today, we need NGOs and civil society in the remaining holdout states to hold their governments accountable. We need to see much more grassroots movement and action by citizens and civil society to raise awareness and rally support for the Treaty's object and purpose. Active NGO and civil society participation can push their governments to go the final mile in delivering on their commitments. Q: Does the NPT Review Conference open up new realistic possibilities for a CTBT? TT: The fact that the most recent NPT Review Conference adopted a final document, which for the first time recognized the CTBT entry into force as a core element of the international nuclear disarmament and non-proliferation regime attests to the international community's strong support for the Treaty's entry into force. I believe that the CTBT -- more than any other measure at our disposal -- bridges the divide between State Parties as it serves to promote all three pillars of the NPT. It signals commitment to disarmament, strengthens non-proliferation, and facilitates peaceful uses. The CTBT in force would be a critical confidence and security building measure in regions such as the Middle East and Asia. It is a practical tool where progress can be achieved in a relatively short time since the Treaty already exists and enjoys near-universal support. It has a strong verification regime that has been tried and tested. It is the norm that there is no more nuclear testing and political will by the international community to ban nuclear testing is evident. What we need now is tangible progress in bringing the CTBT into force thereby taking the first, most importance step towards the complete abolition of nuclear weapons. Q: Will the International Monitoring System and the verification regime when complete be without any loopholes? TT: The CTBT boasts an extensive verification system that is transparent, democratic and non-discriminatory and, the verification regime is already operational. Despite being only partially complete the system was able to detect the North Korean nuclear tests in 2006 and 2009 in a timely and accurate fashion. Upon completion there will be 337 facilities in the International Monitoring System employing seismic, hydroacoustic, infrasound and radionuclide technologies to detect any nuclear explosion regardless of yield. While it may be inevitable that cheaters will attempt to challenge the system and exploit loopholes, the verification regime will provide a strong deterrence against noncompliance with the Treaty's provisions. Q: Would it be appropriate to describe your organisation as THE body paving the path toward nuclear abolition? TT: Permanently banning all forms of nuclear testing is a necessary, though not sufficient condition toward realizing a world free of nuclear weapons. As the body mandated to promote such an important objective, the CTBTO plays an instrumental role in ushering in a world free of nuclear weapons. The nuclear non-proliferation and disarmament regime cannot be strengthened without a CTBT in force and the CTBT will become a more powerful tool within a more robust overall nuclear non-proliferation and disarmament regime. Q: More than 30 countries, which are presently not harnessing energy from the atom, are actively considering embarking upon nuclear power programmes. These include both industrial and developing economies. How far does this jeopardise your efforts for promoting the cause of CTBT?